If you like the fall color displays that maple trees put on but don't have the room for a large tree, consider the Amur maple. This small species has both leaves and samaras that are brightly colored. The Austrian pine is one of the more versatile pines and will grow in a wide variety of soil types and environmental conditions. It needs little maintenance besides watching out for any pests or diseases like bark beetles. There are not very many species of deciduous conifers. These curious specimens straddle two worlds by bearing cones and losing their leaves. The dawn redwood fits this bill, with leaves that put on an autumn show before falling off. This is one of the earliest blooming trees and the profusion of pink blooms will be striking against a snow-covered landscape. It is also one of the money trees that attract hummingbirds. Who doesn't love watching ginkgo leaves flutter in the wind? The ginkgo biloba tree is dioecious and only the male trees are usually planted because the females produce stinky fruits that mess up sidewalks. The goldenrain tree can handle a lack of water if it has had a season of full watering when first planted. If you are looking for a tree that will blossom in the middle of summer, this species fits the bill. It will produce a shower of yellow flowers that are followed by brown pods. Jacaranda trees are favored for their abundant display of purple blossoms. While you may have a lot of debris from the flowers and leaves, it is highly worth it to plant one of these wherever you can. While elm trees used to be quite popular, Dutch elm disease has become more common and many people choose to plant other trees. Japanese zelkova is now used as an elm tree alternative, as it is related and has a similar appearance, but does not have anywhere near the same problems with Dutch elm. When times were tough financially for the American colonists, they found that one substitute for coffee came from this tree. You should probably not try this concoction yourself, however, as ingesting large amounts can prove to be toxic. While the mimosa tree can be invasive in some areas and is discouraged by many, it can be a good choice for drought tolerant areas where other trees have trouble. The airy pink blooms add interest and a pop of color. They are another tree that can attract hummingbirds as well. The pecan tree is actually one type of hickory nut. They are a member of the Juglandaceae (walnut) family and are related to walnut trees. In addition to providing edible fruits and lumber, it can serve as an attractive shade tree that forms into a vase shape. One highlight of the Persian ironwood is its bark, which is a patchwork of shades of yellow, green, reddish-brown and pink. If you want a weeping form, look for the 'Pendula' cultivar. One of the most common trees with purple leaves is the ​purple leaf plum. 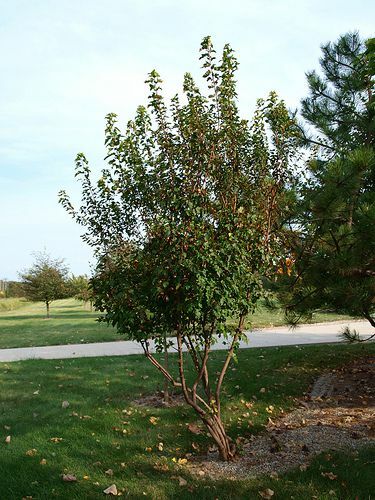 Though they are striking with their purple foliage and fruit, they can fall prey to some of the diseases and pest that seek out members of the Prunus genus. The bright red flowers will definitely stand out in your yard and bring one of our favorite birds, the ruby-throated hummingbird (​Archilochus colubris). The saponins found in this plant are potentially poisonous for people and no part of the plant should be eaten. These saponins can also be used to make soaps. Chances are if you have a cut Christmas tree in your house, it is a Scotch pine. This species is the most popular choice for the holiday season. It also happens to be found in most areas throughout the world. The white flowers on this evergreen tree can be up to a foot in diameter. Do not plant grass under this tree, or any other plants for that matter. They will struggle to grow properly. The southern magnolia is the state flower for Louisiana and Mississippi. Many honeylocusts planted in urban areas are this thornless variety. The source of the name "honeylocust" is the fact that the taste of the pod's pulp is sweet like honey. This tree will put on an autumn show, but be aware that there will be a LOT of the little leaves to clean up once the leaves fall off. Our streets would be filled with them each year. The weeping blue Atlas cedar is sure to be a focal point in the area that you plant it. The weeping bottlebrush is a member of the Myrtaceae (myrtle) family and it gets its common name from the red stamens that look like the brushes used to clean bottles. You will need to prune it into a tree shape (how it is often found) unless you want it to become a rounded shrub. This large shrub or tree is in the Ilex genus, which is part of the Aquifoliaceae (holly) family. They can be used to create topiaries and hedges, as well as serving as a windbreak. The Yaupon holly is perfect for planting in a wildlife garden, as many birds and mammals love to eat the red or yellow drupes. If you do want the trees to have fruit, you will need to have more than one as they are dioecious.